Houseplants are an incredible addition to any room in your house and can be extremely easy to keep alive if you know how to properly care for them. 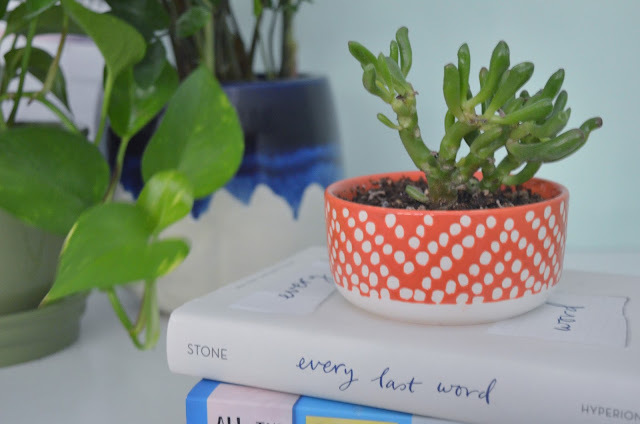 Below I listed a few tips I've found helpful when caring for my own houseplants. Remember - I am not a plant-ologist. The labels that are typically attached to houseplants when purchased are incredibly important, especially if you aren't familiar with the care instructions for specific plants. These labels usually provide you with the amount of sunlight and the watering instructions that your plant needs in order to survive. If your plant doesn't come with a label, Google is always a good backup. Some plants need direct sunlight while others only need morning light. Giving your plants the right amount of sunlight is extremely important when it comes to lengthening their lifespan. I typically water my plants every few days, but if the soil in a specific plant seems moist, it could go a few more days before the next water. You really just have to give the plant water when it's thirsty. Succulents can go even longer without water, but I still like to judge it based on the moisture/dryness of the soil. Sometimes, plants can be sick, even before you buy them. It might be hard to distinguish the sick from the thriving, but they're always mixed together. If a plant dies and you do everything right, don't let that discourage you from adding more plants to your collection or replacing others and naming them Claire Danes 2.0 - the Claire Danes that doesn't tragically die next to Leonardo DiCaprio. If you're looking to buy a plant that is super hard to kill, spider plants are your best option. I currently have 3 spider plants at the moment - one mommy plant and two of it's babies (since spider plants create little baby spider plants that can be picked off and replanted). Or you can always take the easiest route there is and go for the fake plants. There is absolutely no shame in owning fake plants. Ikea sells wonderful high-quality faux houseplants... I own a few myself. And those are my insightful tips on how to not kill your house plants! Hopefully none of you experience a tragic Claire Danes incident, but it happens to even the best plant-ologists, probably. Leave a comment below with the names of your house plants, and whether or not you're like me and like to name your plants after actresses.